In this tutorial we are going to start blocking out our level. For this step I would advise you to have the sketches of your level mapping ready. Do not improvise. Things can get really messy and you will end wasting a lot of time if you don’t have taken the necessary time to get your idea for the game conveniently design. Check the steps of the Game Design Process if you haven’t done it yet. To create the platforms for our game, we will develop further our knowledge about Sprites and start covering other aspects such as Levels and Materials. With the sketches of your level design you should also have ready the textures that you are going to use for your game to import into the engine. Check the article How To Create A Tileable Texture if you don’t know yet how to do it. In our Content Browser lets jump to the folder Maps. In this folder we are going to store all our levels. Our game can have multiple levels or just only one and these can vary in size and content. We are going to change the name of the existing level to Level1 just by right clicking on it and choosing the option Rename. We can create as many levels as we need for our game. To create a level just unfold the menu by right clicking in an empty space in the content browser and choosing the option level. Now you can switch between levels double-clicking on them and notice that when you do it, Level2 is empty in your viewport and in your world outliner. If you ever open your engine and everything is empty, make sure before you panic you are in the correct level. 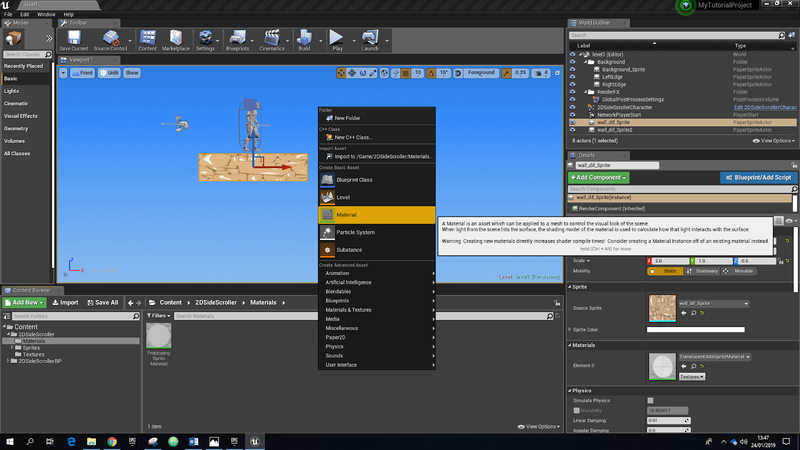 To make sure that our engine and game opens in our chosen level we are going to arrange this in the Setting tab in the Toolbar above your Viewport. Project Settings will launch a new window with all the project settings menu, and there we will choose in the left side of the screen, under Project, the Maps and Modes option. 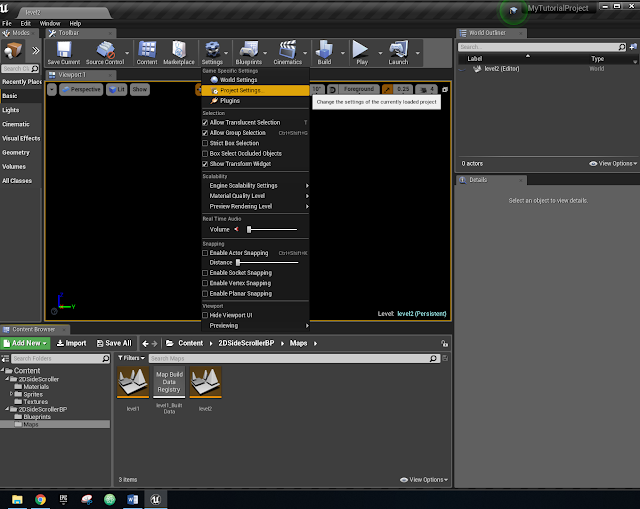 In the Default Maps we will tell the engine where to open our Game and where to open the Editor. 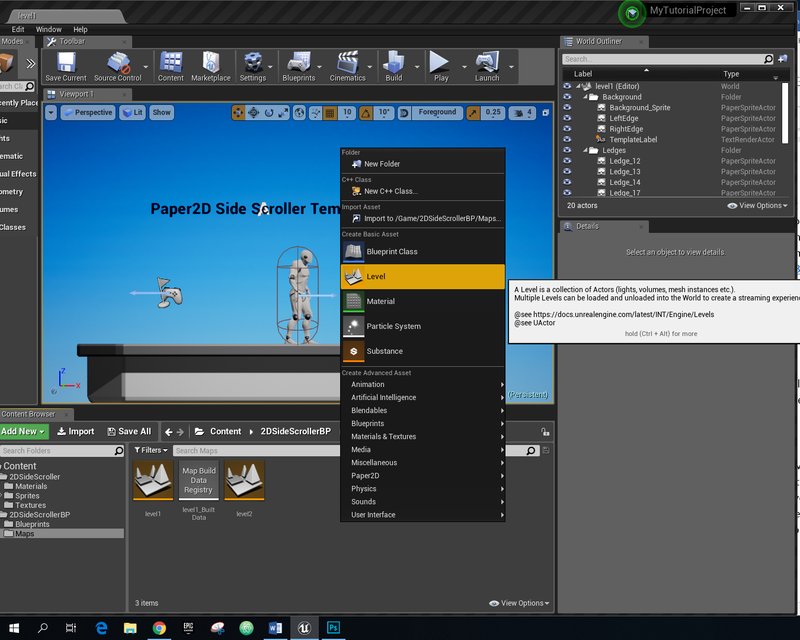 We have not built yet any user interface but normally our game should start in our Menu, and the editor in the level that we are building. So, we are going to make sure, for now, that everything opens in our Level1 and close this window. Now we are going to star blocking out our level. The simplest platform that we can create is a simple sprite that has a fixed position in our level. We are going open our Texture folder in the Content Browser and Import our textures for the Platforms (Remember: Seamless texture, .png or .tga and power off two). Now create a sprite with your imported texture and drag it to your sprites folder (Right click on the texture>sprite actions> create sprite). We can drag now the sprite to our viewport under the character to have him standing there. Make sure in your details panel that the sprite location value on the Y axis is 0 to interact with you character. My texture is 512X512 px large and I think is looking to big under my character. There is few ways to scale this. This last option is my personal preference because it affects the sprite in the content browser not only in the viewport so I will not have to scale it every time that I drag the sprite to the viewport. If I modify the Pixels Per Unit to 2.56 (closest power of 2 value) the size of my platform will be considerably smaller, but I am still not happy with the way this platform looks. I want it to be half in height (Z axis) and double in length (X axis). So, let’s try to scale this in the Details Panel (Scale 2 in the X and 0.5 in the Z). Now, if we compare with the original texture it seams like the pattern has been stretched. We are going to fix this in our next section. With the sprite (platform) selected in the Viewport lets focus on the Details panel. In the way it is right now our sprite is using a default material that has not the capacity to scale in a proportional way depending of the position that occupies in the world. We are going to create a new material that will scale without stretching the texture of our platforms. Now, if we double-click in the new material, we will open the graph to do our own coding. Make this new window smaller to give yourself space to drag into the graph the texture sample, and from your texture folder just drag the texture to the graph. From the white node of your texture sample drag out and connect to the emissive colour. Right-click in an empty space and type world position and choose this option from the menu. To understand the following steps, think about how you would work out a percentage of something. This is exactly what we are going to do in our next steps. Now we need a Scalar Parameter. Right-click in an empty space, type Scalar and selected and name this Scalar, RepeatsPerMeter. From the RepeatsPerMeter now we must pull the node out and type divide, and to this parameter we have to connect a constant. To call the constant we can pull the B node and type Constant or just press key 1 and click in an empty space and then connect to the B node. In the details panel with the constant selected we give to it a value. I will give to mine 100. And to the RepeatsPerMeter parameter we are going to give a default value greater than 0. Apply and Save your new material. 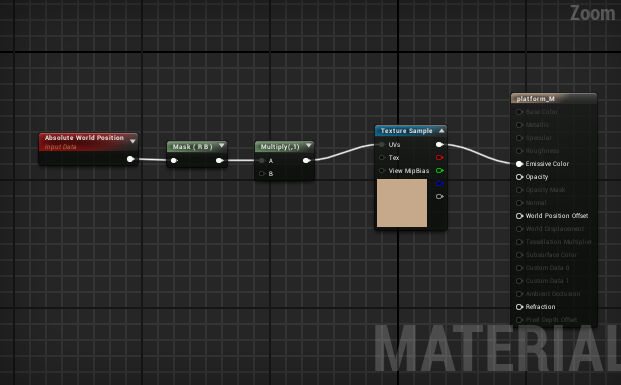 Now you can safely scale your platforms without stretching the pattern if you apply this material to them. To apply the material, you can do it by opening the sprite menu and this will be effective permanently for every time that you drag this sprite in the viewport. Or you can drag first the sprite to the viewport and then drag the material on the sprite in the viewport and this will only affect to that sprite in the viewport. Every platform that you position in your viewport has to be above the Kill Z. Anything that happens below that line will stop the game. The kill Z is, in your viewport, from the two red lines the brighter one. The other one is your X axis. 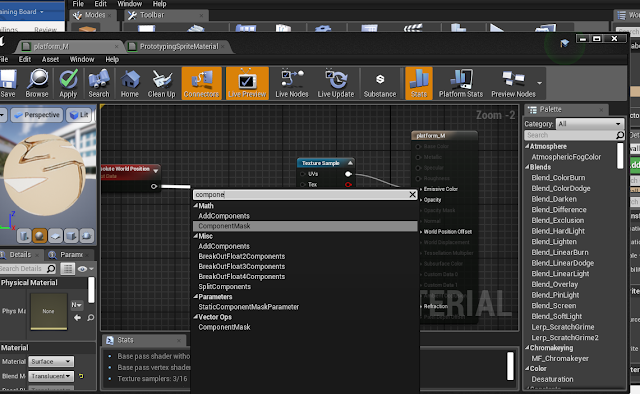 In the next tutorial we will learn how to build Lift Platforms, talk about Blueprints, Graph Events and Functions.